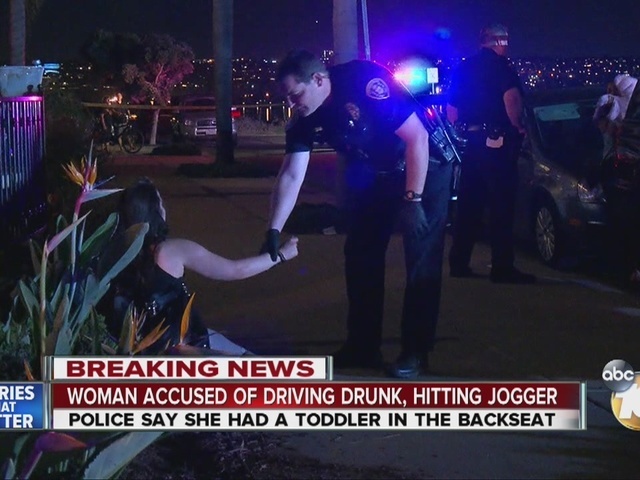 A hit-and-run driver with her 3-year-old daughter in her car crashed into a jogger and a car in Pacific Beach and was arrested after hitting a second vehicle so hard it disabled her car, San Diego police said. The woman, whose name was not immediately released, was driving a Kia north on Crown Point Drive when she struck the first vehicle near Belmont Park around 6:20 p.m. Monday, according to San Diego police Officer Dino Delimitros. She continued north and crashed into a 23-year-old man jogging in a bike lane near Lamont Street shortly afterward and again did not stop, Delimitros said. The jogger suffered a broken leg and pelvis, according to the officer. The driver hit a second parked car while rounding the corner to Lamont Street, which left her car undrivable, Delimitros said. She was arrested on suspicion of felony hit and run and felony child endangerment, Delimitros said. She was also suspected of drunken driving, according to news reports.